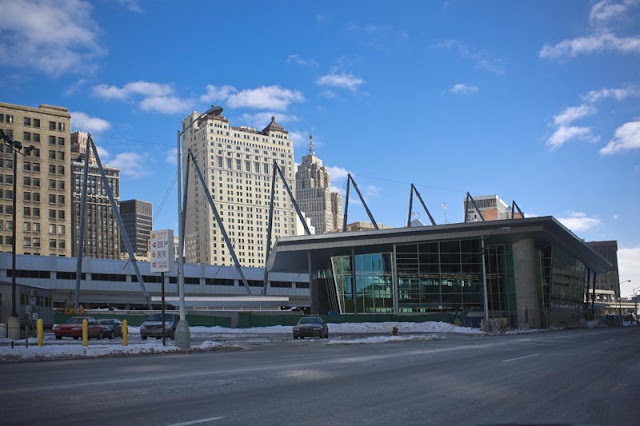 Contractors are almost ready to raise the canopies at the Rosa Parks Transit Center. I can now put a name to this previously unidentified house on Watson. 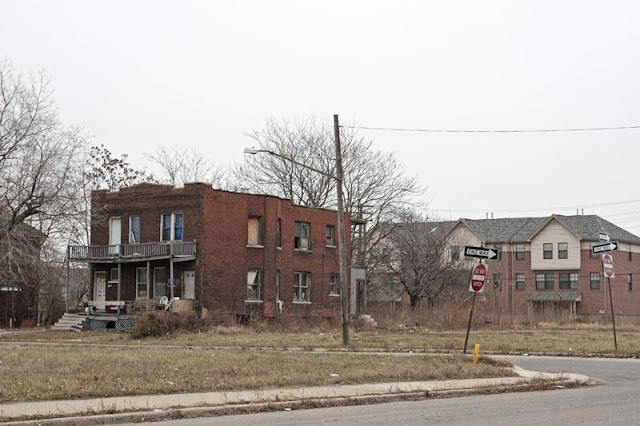 While I was researching Brush Park on Virtual Motor City. I discovered this photograph from 1931. 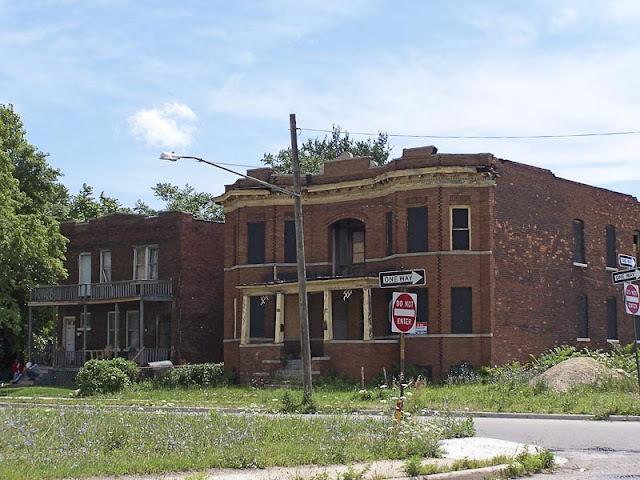 At the time, this was the location of Mercy Hall Hospital, a small Detroit facility for indigent cancer patients, founded by Loretta Mary Gibson. It relocated to 269 Mack in the 1940's. This section of Hendrie at Beaubien is one of the few blocks not yet devoured by the Art Center Townhomes and Carriage Houses development in the northern section of the Cultural Center District. This building existed in the summer of 2004, but it is no longer there and nothing has risen in its place. When the French landed on the banks of the Detroit River in the early 17th century, they brought their love of alcohol with them. The French opened their homes to the community to share in their love of fine food and drink, but it was the British that brought the public drinking establishment to Detroit. Arcadia Publishing's latest "Images of America" release Detroit's Historic Drinking Establishments explores the rich history of alcohol on the Straits of Detroit. The book's title does a bit of a disservice to the material within. Author Victoria Jennings Ross' work is far more encompassing. With chapters devoted to Detroit's early hotels, cigar industry, breweries, and Prohibition, The History of Drinking in Detroit would be more appropriate. Detroit bars started off as taverns for local residents. As Detroit became a travel destination in the 19th century, the business community had to shift its focus from serving residents to serving visitors. 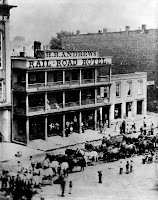 During this time hotel bars took up the mantle of hosting civic affairs from the tavern. Several included menus from this period show us whatDetroiters were eating and drinking at the time. At the heart of the book, however, are chapters focusing on Detroit's Saloon and Cocktail Lounge eras. 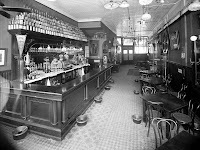 By the turn of the 20th century the saloon era had taken over the city and there were over 1,400 bars in Detroit or one for every 70 men over the age of 20. This is reflected in the numerous pages dedicated to photographs and brief passages relating to the lost gems of pre-prohibition Detroit. When Detroit was at its apex, the Detroit bar scene evolved further. Riding on the coattails of the jazz scene cabaret style clubs sprang up bringing elaborate floor shows and big name entertainers to Detroit. These venues eventually gave birth to the cocktail lounges of later years. There was quite a lot going on in the city at the time and the proof is in the photos, advertisements and menus contained within this book. Pubs and the like have been at the core of Detroit's social being since the city's inception. Whether it be an elegant hotel bar where the city's elite would wheel and deal, or a neighborhood saloon where one of the city's various emigrant populations would socialize, Detroit had a bar for everyone. 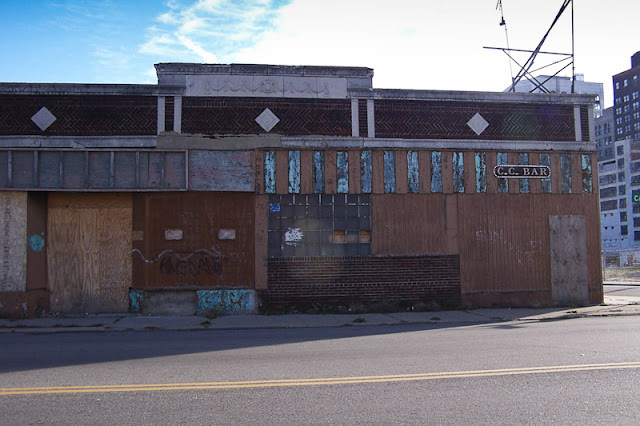 That tradition that still holds true today and Detroit's Historic Drinking Establishments goes a long way towards reminding us of our rich drinking heritage. 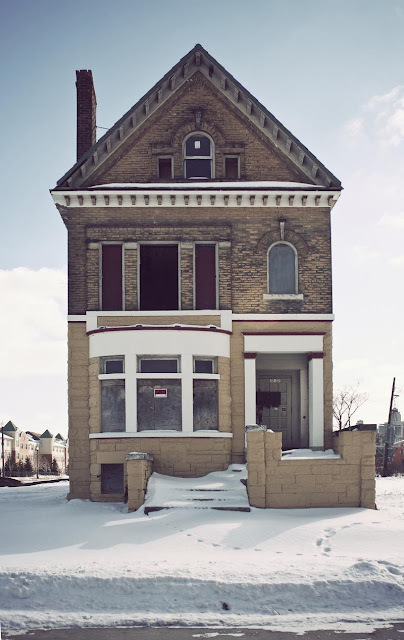 Photos reprinted with permission from Detroit's Historic Drinking Establishments, by Victoria Jennings Ross. Available from the publisher online at www.arcadiapublishing.com or by calling (888) 313-2665. The Fox Theater opened in 1928. Built in the temple style with a blend of Burmese, Chinese, Indian and Persian motifs, it was the first theater to be constructed with built-in equipment for sound films. Music Hall opened as the Wilson Theater in 1928. It has an Art Deco facade with a Spanish Renaissance themed interior. Having left Orchestra Hall during the depression and playing at several other venues, the Detroit Symphony Orchestra moved into the Wilson Theater in 1946 and rechristened it Music Hall. When the Orchestra moved again in 1951 the building was used for other purposes. Rehabilitation began in 1973 and the building was added to the National Register of Historic Places 1977. Music Hall is the last legitimate stage theater remaining in Detroit. It is the only Detroit venue built for the primary purpose of presenting live performances. Trition Pools, originally uploaded by A Dubs. One day after the unheated vacant office tower had its water cut off, the Book Building's last tenant has left and the building has closed. It appears that the new owners who bought the property in August don't want to pay to keep the building open. The Thorn in Ilitch's Side? 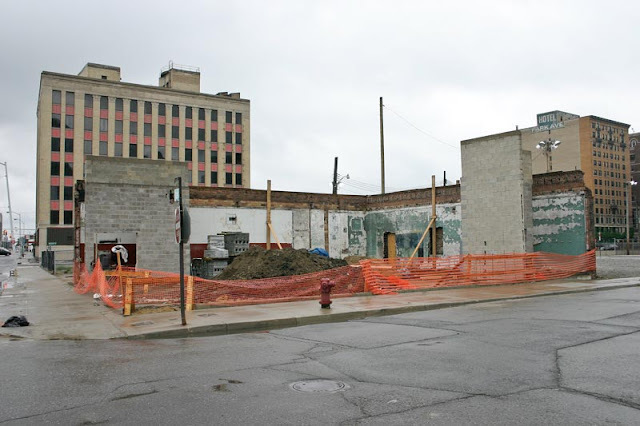 After two plus years of demolition, construction, and reconstruction it appears as though we will finally be able to link a tenant to the building sitting square in the middle of the Macedonian Parking Cartel's vast Fox Town empire. Since the Book Tower has, for all intent and purposes, been put in mothballs, Bookies Bar is being forced to move to new digs. 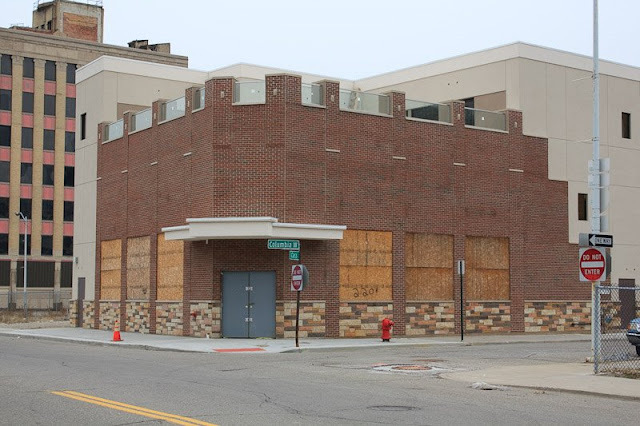 Reports are that the bar will be setting up shop at the location of the former CC Bar at the corner of Cass and Columbia. CC's was demolished, except for one wall, and this new structure has risen in its place. With the money being spent, it looks like the owners of the building plan on being there for the long term. Olympia Development are planing to knock down several buildings in the area. The speculation is that this area will be the eventual home to a new hockey arena for the Red Wings. How will this new development affect these plans? One way or the other the property owners are sure to cash-in. C.C. Bar in the summer of 2007. These two walls were all that was kept from the original building. Today. The future home of Bookies.